If this script appears familiar, that it has been repeated many times, you are right. 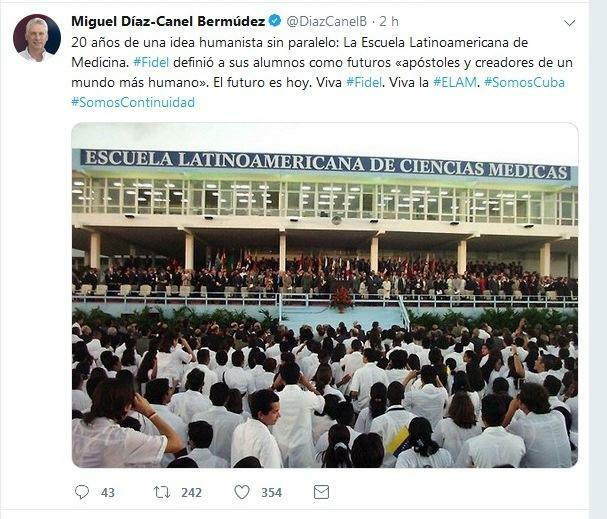 What President-elect Jair Bolsonaro has just done – dynamiting the More Doctors program guaranteeing access to quality health care to millions of Brazilians – is no different from all other attacks by the regional right on Cuban international collaboration. For more than a decade, the Parole Program created in 2006 by George W. Bush, encouraged Cuban health personnel working in third countries to abandon their missions and emigrate to the U.S. – a reprehensible practice that affected not only Cuba but the health programs of countries where they were working. For the researcher, the years during which these policies were implemented made them two of the most important components of U.S. migration policy toward Cuba, but he goes further. “When we place this case within the much broader framework of the United States’ general immigration policy, we see that attracting educated foreigners to fill gaps in the U.S. workforce has been a traditional policy, reflected in the existence of the H1B visa. Under this regulation, scientists, engineers, and doctors have gone to work for institutions and companies in the U.S. – helping to maintain their privileged position throughout the world. This reality has become key to the U.S. economy and its universities,” states the researcher in the aforementioned article. Domínguez reports that there are studies showing that the world’s richest countries have effectively implemented policies to absorb qualified immigrants, although research on the subject is still insufficient. “The area that has received the most permanent attention is the brain drain of medical professionals from poor countries. This is a particularly sensitive issue, due to its ethical and practical implications. In fact, the availability and quality of health care have a significant impact on essential health indicators, which are considered by prominent scholars as a fundamental source of inequality between countries. “In its current state, the brain drain cannot be completely explained without a global analysis, which considers structural inequalities, migration networks, world politics, especially the asymmetries in the distribution of power, and even the hegemony of Western and cultural media. Industries that create images, perceptions and aspirations, thus distorting social interactions of different types,” writes Domínguez. According to the researcher, arguments supporting this assertion are based on a fundamental idea: the brain drain, as part of a global migration pattern, is possible due to the levels of inequality between and within countries, as shown in multiple studies. These inequalities are not accidental, but structural components of the modern world order, understood as a result of the global hierarchy in distribution of power, wealth, and development,” he emphasizes in the article.Following this logic, any attempt to undermine and weaken one of the country’s most valuable resources – its professionals – is not fortuitous, or an isolated chance event. 2. The offer to revalidate the professional credentials of doctors who stay as individuals are deceptive because the country’s Medical Association opposes this. There are thousands of doctors in Brazil whose licenses have not been revalidated. For every 100 doctors who take the required exam, only eight pass. This is a conscious strategy to keep the private health market controlled, to guarantee enormous incomes – fewer doctors equals more money – hence the opposition from the beginning to the More Doctors program.